With physical assets that are built to last, perhaps the industry has been lulled into a false sense of security of believing it’s “safe as houses” and immune to the revolutions currently affecting other sectors. Whatever the reason, it is an issue that needs to be addressed, and addressed urgently. However, things may be beginning to change. Take paper-based conveyancing — the legal preparation of documents for the transfer of property. Traditionally a laborious and convoluted process which can take up to 30 days to complete, it is unnecessarily complex and relies on paper records and parties being physically present at transactions. In a paper-based system, buyers and sellers can experience numerous delays such as a lag in financial approval/settlement and manual processing errors or late submissions. It is inefficient, time-consuming and, until recently, was the only system available for the legal transfer of property. There has to be a better way. And there is: electronic conveyancing (e-Conveyancing). E-Conveyancing minimises the manual processes and paperwork associated with property settlement by enabling lawyers, conveyancers and financial institutions to transact together online via an online property exchange such as Property Exchange Australia (PEXA). Within that digital environment, information can automatically feed in from the original source and can populate all documentation while the system cross-checks that information. Documents are created, signed and lodged within the online environment, and parties complete all necessary steps to settle the transaction within PEXA. It is a vastly more efficient, accurate and secure way of conducting the settlement and lodgement stages of a conveyancing transaction. According to a recent PwC Digital Property report into the impact of e-Conveyancing, 25 per cent of paper-based settlements were delayed, with some customers suffering financially. Further to the PwC research findings (and contrary to public perception), there is much more to purchasing a property than just the auction/price negotiation. An increasing number of people fail to understand the property settlement process, with many — primarily younger generations — often failing to understand what they are actually signing. While many home buyers and sellers currently “trust the system”, there is absolutely no guarantee this will continue into the future. With peer-to-peer funding and banking seemingly on an inextricable rise, there is no reason to assume “the system” will continue to operate as we know it into the future. With the property industry ripe for major disruption — primarily due to a perceived lack of transparency and usability — the establishment and roll-out of e-Conveyancing in Australia is potentially game-changing for buyers, sellers and the property industry as a whole. It can become the symbol for an industry finally beginning to embrace change and digitisation. As customers’ needs, wants and expectations continue to rise, the implementation of a fully transparent, easy-to-use and ultra-efficient property sector will be fundamental, if it is to continue to adapt to meet ever-changing and ever more sophisticated market demands. Mike Cameron is PEXA’s group executive, customer & revenue. A finance industry executive with more than 25 years’ experience, Mike specialises in delivering transformational change outcomes. In his current role, he is responsible for boosting the growth of PEXA’s national e-Conveyancing solution and driving adoption by banks, lawyers and conveyancers. 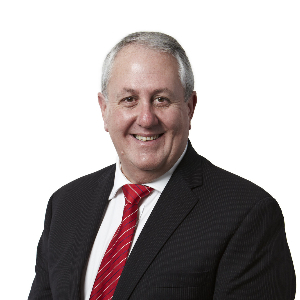 Prior to PEXA, Mike held several leadership positions at National Australia Bank. He holds a Diploma in Management from UNSW Business School and a Diploma in Manufacturing from RMIT University. Property Exchange Australia (PEXA) — Australia’s online property exchange network — was established in 2010 to deliver a single, national e-Conveyancing solution to the Australian property industry that’s fast, safe and efficient.